New Delhi, March 23: Despite repeated denials and flip flops over forging an alliance with the Aam Aadmi Party (AAM) in Delhi, the Congress on Monday has reportedly scheduled a meeting which will be attended by party President Rahul Gandhi to take a call on whether the Congress and AAP will enter an alliance before the 2019 Lok Sabha Elections. Gandhi will be meeting Sheila Dikshit and other Congress leaders in the capital to discuss alliance with AAP in Delhi, Punjab and Haryana, said reports. Congress-AAP Alliance in Delhi For Lok Sabha Elections 2019 Favoured by Senior Leaders, Rahul Gandhi to Take Final Call Soon: PC Chacko. Though senior Congress leader Sheila Dikshit and her supporters are against the alliance, a large section of Congress leadership is in the favour of alliance with AAP. 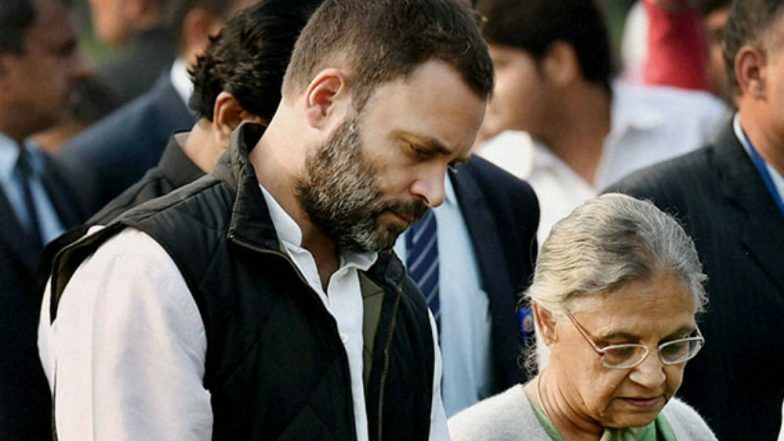 Sheila Dikshit Writes to Rahul, Sonia; Says Coalition with AAP Will 'harm' Congress in Long Run. The Aam Aadmi Party (AAM) was open to alliance with the Congress despite facing strong opposition from its workers in Delhi. However, after getting no go ahead from the Congress leadership, AAP declared candidates from all the seven Lok Sabha seats from Delhi. But NCP Leader Sharad Pawar's intervention helped keep the alliance discussions between the Aam Aadmi Party and the Congress alive. Sharad Pawar took the mantle of mediator between both parties to stitch an alliance in Delhi in order to mount a unified campaign against the BJP. Lok Sabha Elections 2019: NCP Chief Sharad Pawar Mediating Alliance Talks Between Congress And AAP in Delhi. Hopes of an alliance with the Congress was also ignited after the Aam Aadmi Party (AAM) joined the Mahagathbandhan (Grand Alliance) in Bihar. PC Chacko and other senior leaders from Congress are also said to be in the favour of alliance, said reports.